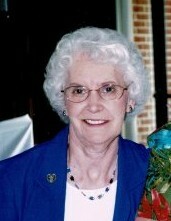 Patsy Marie Rooney (nee Thomas) 83, formerly of Glen Burnie, passed after a lengthy illness. Born to Clarence and Martha (nee Armiger) she would spend her life in this area from 1964 until moving to Westminster 18 years ago. A devout Christian throughout her life, she was a member of the Glen Burnie and Deer Park United Methodist churches, specifically volunteering in the United Methodist Women, doing charitable work. She enjoyed reading very much and was a loving mother and devoted wife. Patsy joins her late husband of 45 years Paul J. Sr., who passed in 1999. Surviving her is her loving daughter Donna M Stolzenbach and two beloved sons, Paul J. Jr., and his wife Brenda and Tim P. and his spouse Andrea. A dear daughter Debbie Rooney precedes her in passing. She has a number of beloved grandchildren, Nicole and Kristin Stolzenbach and Jennifer, Maggie, and Chloe Rooney. Patsy also has 4 cherished great grandchildren, Cobe Hahn, Riley Bouwens and Stephen and Gabrielle.